Most of my games have been live games with Pop Up Playground, where from 2011 to 2018 my work including creepy clowns game The Curse, choose-your-own-Shakespeare in #TrueRomansAll, app-assisted bike adventure 1000 Cities, and most famously the live-action bank heist experience Small Time Criminals. But I also design other kinds of games, and you can find information about those below – some are even free to download and try at home! If you play them, please let me know. My first videogame as head writer, Table of Tales: The Crooked Crown comes to PlayStation VR in 2019! It’s a digital twist on classic tabletop RPGs, set in a world of sorcery, swashbuckling and scoundrels, all overseen by an enthusiastic magical game master, Arbitrix. I’ve been working on this with Tin Man Games since late 2016, and now it’s been officially announced I am super excited to share it with you! Check out the trailer below, and read more about it in the Tin Man Games blog or at the Sony PlayStation blog. This game is in playtesting at the moment and will be my first fully-formed tabletop RPG, designed for one-shot games which aren’t entirely serious. I’ll be crowdfunding production of the PDF and physical zine format editions in February 2019 as part of Kickstarter’s “Zine Quest” collection; watch this space for more information! 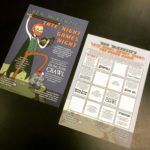 Ben’s last-minute six-nights-only late night board game show during the 2018 Comedy Festival definitely wasn’t just an excuse to make a flyer with a complete, playable board game on the back… But it was partly that. You can download a PDF copy here for your own enjoyment. See any of the shows featured in the Safety House Guide. Collect a flyer from a performer whose show sounds appealing to you. Share your thoughts about a show you loved (with a link) on social media or a festival web site. Book tickets to a live performance featuring performers you’ve never seen before. Agree to play a game you’ve never played before. Go to a public playful or games event, like the ones organised for the Freeplay Independent Games Festival. Contact Ben and tell him about a challenge you created for a blank space. Let the other players pick one of the challenges on the board you haven’t done yet; you must pass that challenge to win. Forget about having a challenge at the end, you just win when you land on FINISH! Every adventurer has to start somewhere! 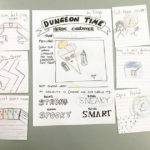 Dungeon Time is a storytelling game workshop for kids who want to get into fantasy adventure roleplaying. It involves simple, easy-to-learn rules for generating your own dungeon-crawling adventures – without even needing a Dungeon Master! Super Mega Battle Fight Time Go! Life can be tough when you’re a teenager – and being attacked by monsters all the time doesn’t make it any easier! Super Mega Battle Fight Time Go! is a mini-RPG for a GM and 3 or more players. You play young adults suddenly gifted with the power to turn into masked superheroes, who must fight monsters – and the social challenges of being young adults! It’s inspired by Japanese tokusatsu TV shows like Kamen Rider and Super Sentai (aka Power Rangers). I wrote this tiny RPG back in 2014 for the ConTessa D3 Microgame of Stupefying Wonder challenge. ConTessa is a women-led online gaming con, hosted on Google+. The restrictions for the challenge were that you could only need paper, pencils and a 3-sided dice, and that the whole game had to fit on a single postcard (though two sides were fine). 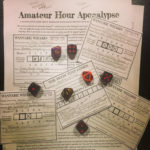 The winning entry was “The Guild of Orpheus” from my friend and incredible RPG designer Grant Howitt; you should check out his games, they’re some of my all-time favourites. Can one hero really protect all of infinity? Perhaps – if they live multiple lives! A Mysterious Wanderer in the Fourth Dimension is a mini-RPG with no Game Master, in which a group of friends all play different incarnations of a “mysterious wanderer” who fights for good across time and space, sometimes failing but always reincarnating – until a final battle with a great Evil forces all their incarnations to team up for one last stand! I think it’s pretty obvious what my influence is here. I have a fascination with breaking Doctor Who down and seeing what similar but very different things you can assemble from its essentials. This game was my first attempt at doing so for others to play. 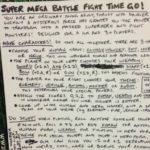 Intended as an entry for ConTessa’s microgame challenge in 2014, it wouldn’t fit in the space provided so I entered my other idea (Super Mega Battle Fight Time Go!) and finished this version later, with some helpful input from Grant Howitt and Patrick O’Duffy. Even now it’s a bit squashed, and probably not quite finished; I’d love to give it a bit of polish. 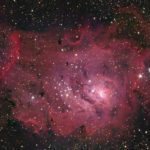 If you play it, please let me know what you think.